What began as my “pipedream” project to create a limited-edition print of The Unipiper has unexpectedly turned into a much larger adventure! While shooting images of The Unipiper at Peninsula Park in N. Portland in November, I learned that The Unipiper, aka: Brian Kidd, has always dreamed of parlaying his eccentricity into a way to preserve the city’s unique culture. He’s been thinking about it for years! And now, his dream is becoming a reality. 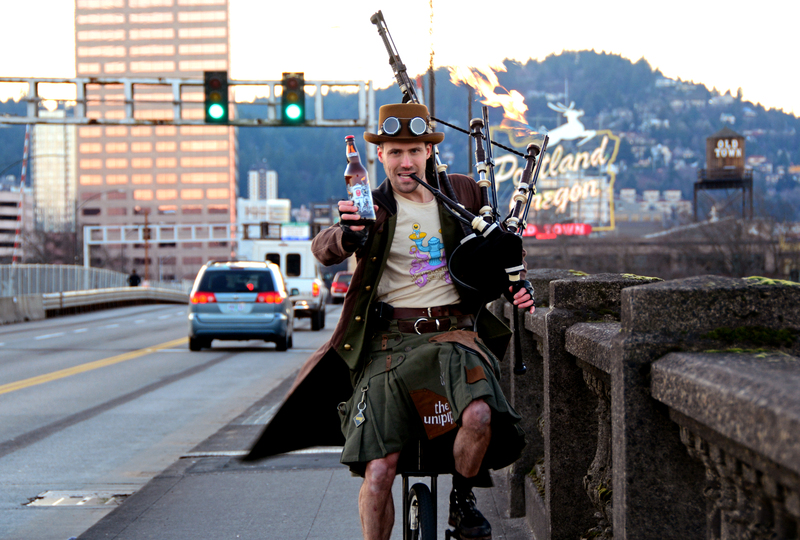 The Unipiper has started his own ‘Weird Portland United’ , a non-profit 501(c)(3) that will discover, support, and cultivate up-and-coming and long-standing purveyors of weird through official Weird Awards, an official register of Weird Historic Places, the Weird Portland Museum, tours of Weird Portland, a Weird Portland Festival, and more. Simultaneously, Portland Brewing started a “Keep Portland Weird” series of craft-brews. The series features distinctly Portland collaborative brews with the aim of highlighting each collaborator’s contribution to keeping Portland weird. The first series feature? Unipiper Hazy IPA, of course! Thanks to a generous seed donation of $5,000 from Portland Brewing, Brian Kidd’s “Weird Portland United” is kicking off January 24th, 2019! And the best part? They asked ME to design the beer labels! 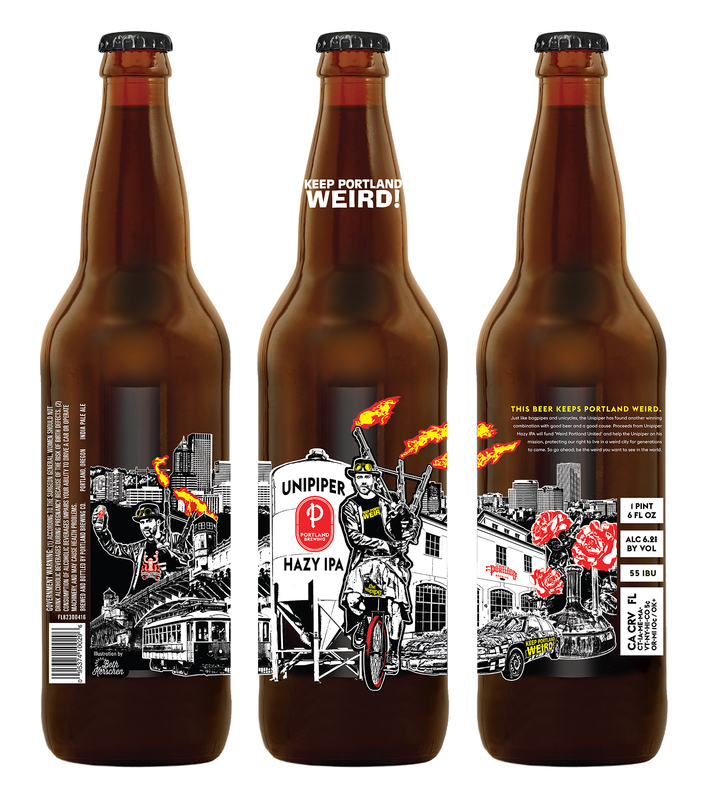 So, I’ve joined forces with Portland Brewing and Portland’s favorite icon, The Unipiper, to design limited-edition beer labels for the release of the new collaborative beer – Unipiper Hazy IPA. 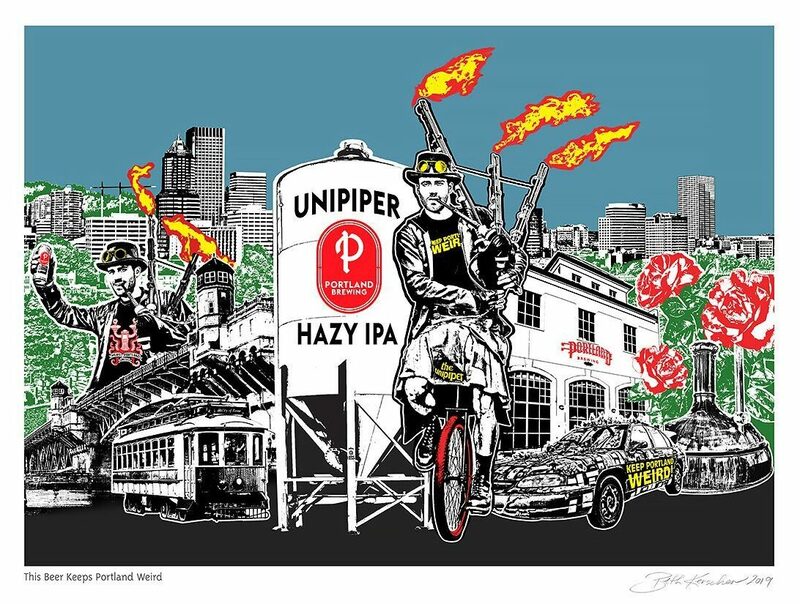 A percentage of sales from Unipiper Hazy IPA will support The Unipiper’s new non-profit, as will a percentage of sales from my This Beer Keeps Portland Weird art print. Unipiper Hazy IPA starts with a small run of limited-edition 22 oz silk screened bottles, featuring my artwork. I’m so honored! You can find Unipiper Hazy IPA at the bottle signing events below as well as select stores and bars around town. You can order the limited-run print here, on my website.